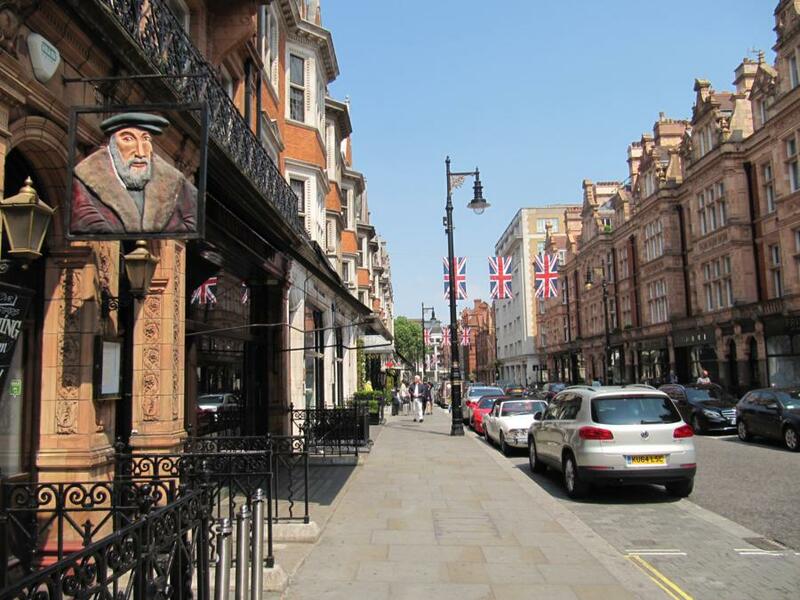 A walk in Mayfair may seem an unusual choice, given the many tourist destinations that can be seen at a short distance from here, but it is precisely for this reason that I have chosen it: for its atmosphere, its shops that seem stopped in time, its hidden squares and secret gardens. All at a short distance from the hustle and bustle of central London. A walk in Mayfair is like diving into the past to discover another London: calmer, more sophisticated and pleasantly old-fashioned. Mayfair is also luxurious – we all know that – but not ostentatiously so. Rich, but with a sort of sobriety. The walk is about 4 km long and can easily be done withinin a couple of hours, not including any visits to various places places of interest, shops (for example, the length of the stop at Fortnum & Mason may depend on your shopping mood as well as the your credit card limit…), gardens and pubs. This is a circular walk, starting and finishing in Piccadilly Circus. From Piccadilly Circus we head down Piccadilly, which marks the southern limit of Mayfair. The street is lined with buildings of historical importance: on the left hand side we come across St. James’s Church, which dates back to the 17th century. It was designed by Christopher Wren, the architect of the famous St. Paul’s Cathedral, one of London’s most recognisable landmark. Within its courtyard are the stalls of Piccadilly Market, a small market with daily theme variations: antiques on Tuesdays, and arts and crafts from Wednesday to Saturday. 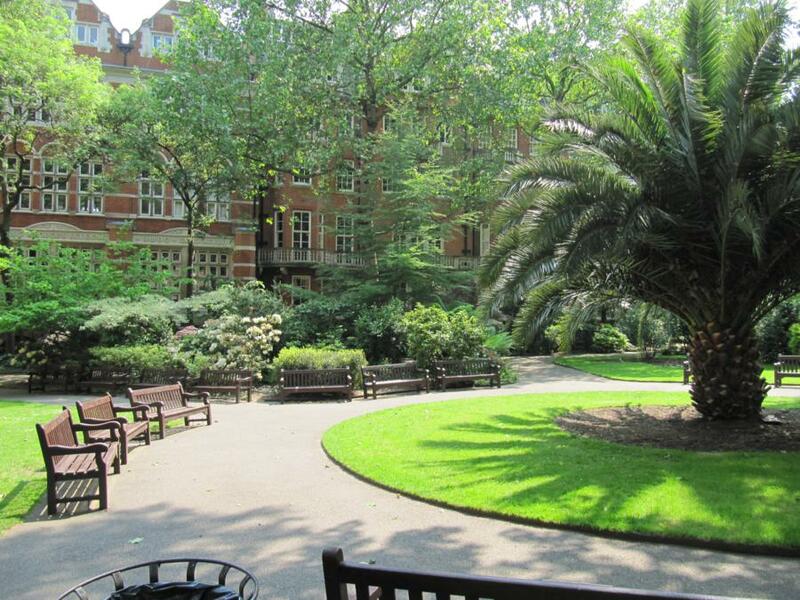 This is one of the first hidden gem of the area: if you are looking for a quiet corner at a short distance from Piccadilly, cross the courtyard and reach the garden on the right; it’s a true oasis of peace, and finding one so close to Piccadilly it’s quite remarkable! 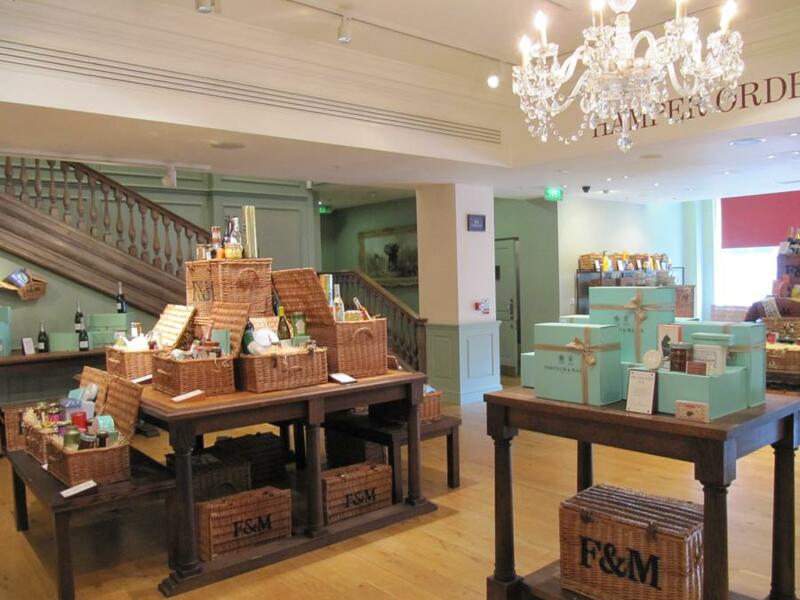 Continue walking down Piccadilly and you will find yourself in front of the famous store Fortnum & Mason. 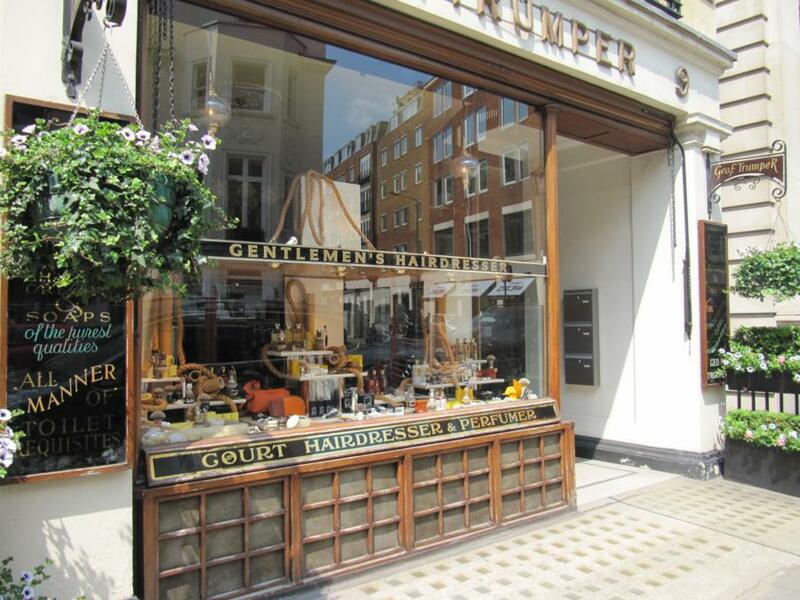 Founded in 1707 it’s one of the greatest shops in London, and if you have never seen it before, get in! Maybe not the best place to do some shopping (the prices are definitely high), but the staff is very courteous and will leave you wandering around. 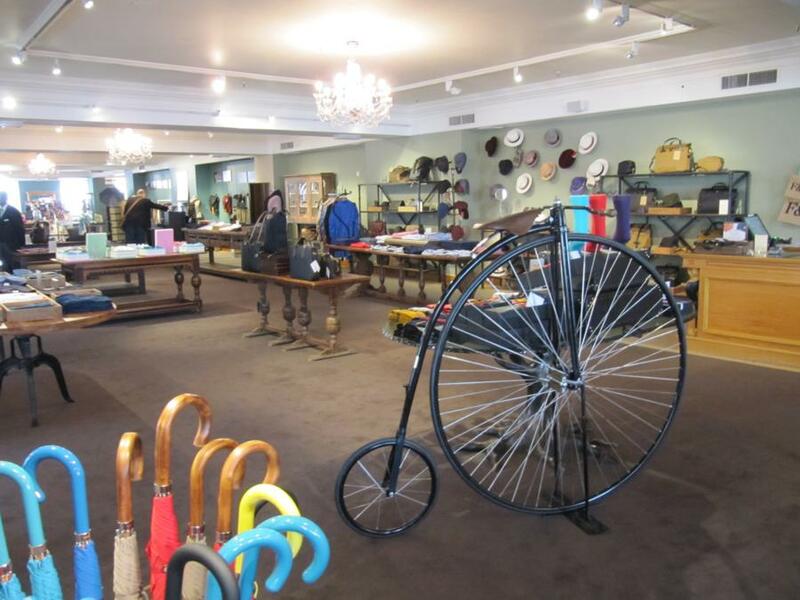 Just take a look at the photos below and you’ll realise that this is not a shop as another. 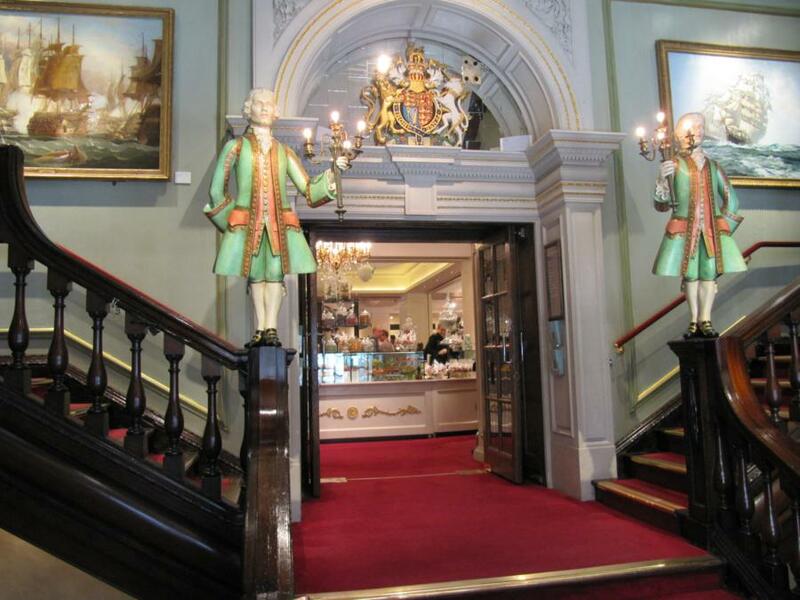 If you’re curious, or just want to know more about the incredible story of Fortnum & Mason, you can read it here. Leaving Fortnum & Mason, on the opposite side of the street, at number 46, you can see the Albany, one of London’s most prestigious addresses. Did you know? The Albany was initially converted into apartments (69 to be precise) to provide the bachelors of good English society with a central pad for their errands in town. Today even women are admitted, but the level of exclusivity is certainly not decreased. Recently (August 2015) a 3 bedroom apartment was for sale at over £ 3,000,000 and a small one bedroom apartment was let at £ 850 a week! A good number of apartments (called set) belongs to a college of the University of Cambridge – Peterhouse – which has seen fit to invest in the lucrative London luxury property market. Definitely a good investment! Among his most celebrated tenants we must remember the poet Byron. Further down Piccadilly we find another historic building, Burlington House, which houses the Royal Academy of Arts, the oldest English art school, founded in 1768. Within the Burlington House are the offices of various associations and Societies, including the Linnean Society, to which – in 1858 – Charles Darwin sent a script that became the basis of his famous work, “The origin of species“. Mayfair has numerous links with the scientific and literary world. If we turn right in Albemarle Street, for example, at number 50 was the publisher John Murray, famous for publishing works of Byron, Jane Austen, Arthur Conan Doyle – the creator of Sherlock Holmes – and Charles Darwin’s The origin of the species. At number 21 you will find the Royal Institution of Great Britain. Founded in 1799, the institution has always attracted the most important scientific minds in the country and not less than 14 Nobel prizes! Today, the building also contains the Faraday’s Museum. Did you know? The public lectures which were held at the Royal Institution of Great Britain became so popular as to cause an unprecedented traffic in the road. To overcome this problem, the road, for the first time in London, was transformed into a one-way street. At the end of Albemarle Street turn left, then left again into Dover Street and then right into Hay Hill. Cross Berkely Street and continue straight on Curzon Street. This is not a particularly attractive part of our walk, but it is the shortest way towards Shepherd Market, an area of Mayfair which owes its name to the historic market that was held here from 1686 until 1707. Traditionally, a big fair was held here in May, and it is this event that gave its name to the whole neighborhood. Finding the entrance to Shepherd Market is not easy: you have to walk on Curzon Street until you pass the intersection with Half Moon Street; just after the church you can admire the peculiar Geo F.Trumper shop, a barber and perfumer for men trading on these premises since the Victorian era; on the opposite side of the street you can see a passage that leads to the Shepherd Market area. 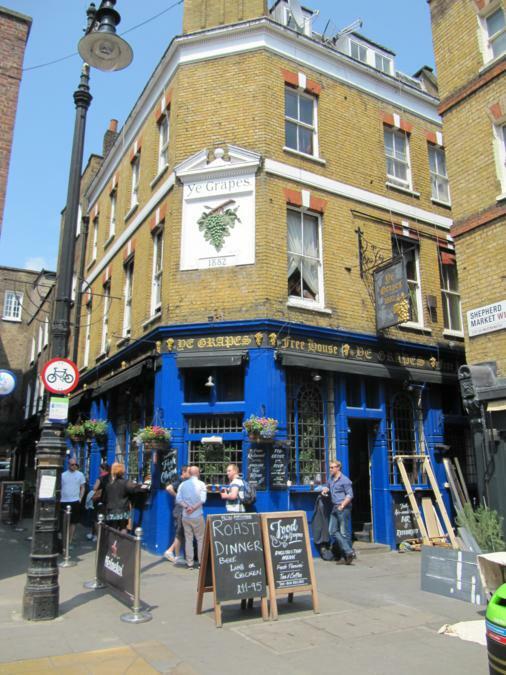 At the end of the narrow passage on the left hand side you will find the nice Ye Grapes pub, a perfect place for a short break and a good pint of ale! 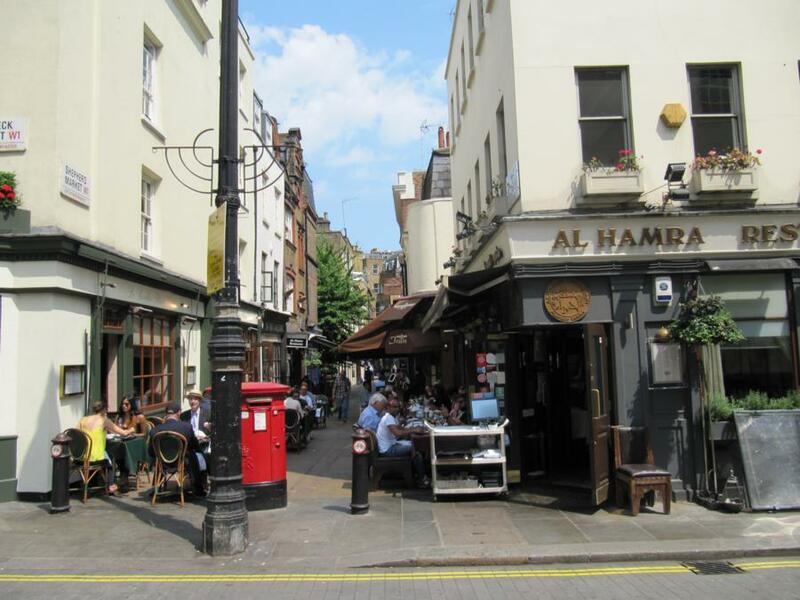 Entering this area you will leave behind the noise and confusion of London and the tables outside the little restaurants give an unusual Mediterranean feeling to the narrow streets. You can continue wandering around the Shepherd Market area for a while, then turn on Hertford Street; at the end of the road can see the embassy of Saudi Arabia. Turn left onto Curzon Street and then right on Chesterfield, characterized by fine Georgian buildings. In one of these houses – on the right – you will see one of the blue plaques that identify the buildings with some historical link: here lived the famous Beau Brummell – the most stylish man in the early nineteenth century London. Mayfair conveys a sense of style and elegance, but as I said at the beginning, always very contained, without extreme luxuries or excesses. Even the exclusive Clubs and Casinos that can be found in this area are somehow kept hidden from the public view. 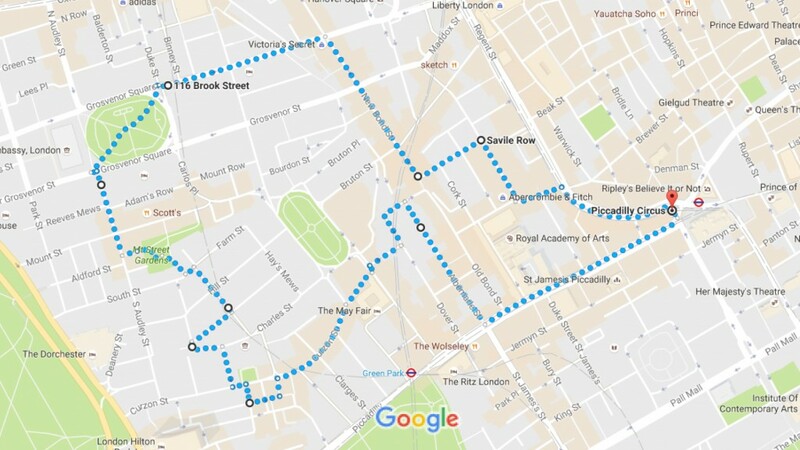 We continue left on Charles Street and then right on Hay’s Mews and then left again onto Chesterfield Hill, at the end of which we turn right and enter through a narrow passage in the beautiful Mount Street Gardens. Here is another beautiful hidden corner to be fully enjoyed when the weather and the temperature are favorable. Isn’t it a nice place to spend some time in peace? When you are ready to leave the gardens exit onto Audley Street, turn right and you will arrive in Grosvenor Square, where – on the left – you can see the American Embassy (it will soon move to Nine Elms, on the southern bank of the Thames, but for the time being it is still here in Grosvenore Square). Cut diagonally across the gardens and go out on the opposite corner on Brook Street (to our right we can see the Italian Embassy). Did you know? Much of this area still belongs to the Grosvenor family. Among their old ancestors is a French knight – Hugh d’Avranches – who accompanied William the Conqueror in his expedition to England in 1066. This is what I call an old family! The French term Gros Veneur (hence the name Grosvenor) means “the fat hunter” and it was probably a nickname due to Hugh’s passion for hunting and for good food! Along Brook Street at number 25 we can see the house – now converted into a museum – where the composer Handel lived. Funny coincidence, at number 23 lived another famous musician – Jimi Hendrix – and the museum combines the stories of these two musicians. Just after the museum, turn in the narrow passage and follow it all the way through. 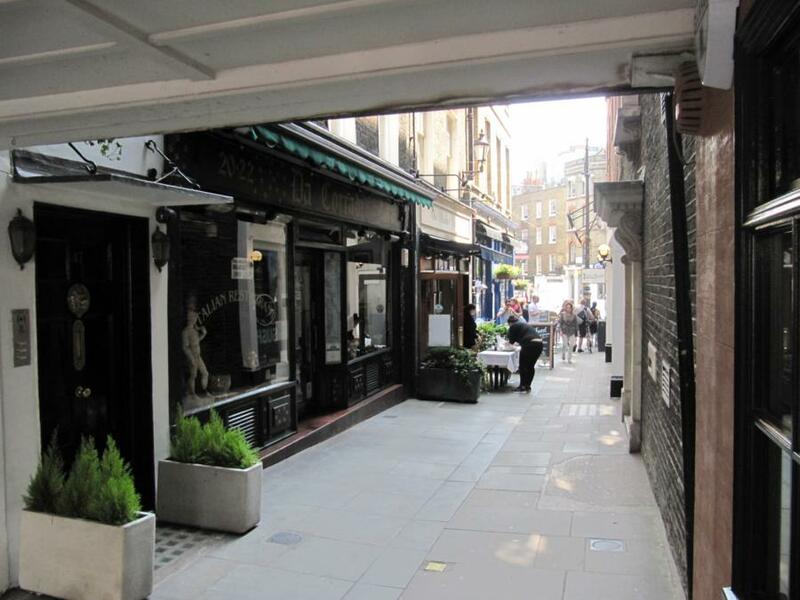 You can always go straight and turn right at the next junction onto New Bond Street, but isn’t it great to discover these narrow alleys, so typical of London? If you follow this path, at the end turn left until you arrive on New Bond Street. 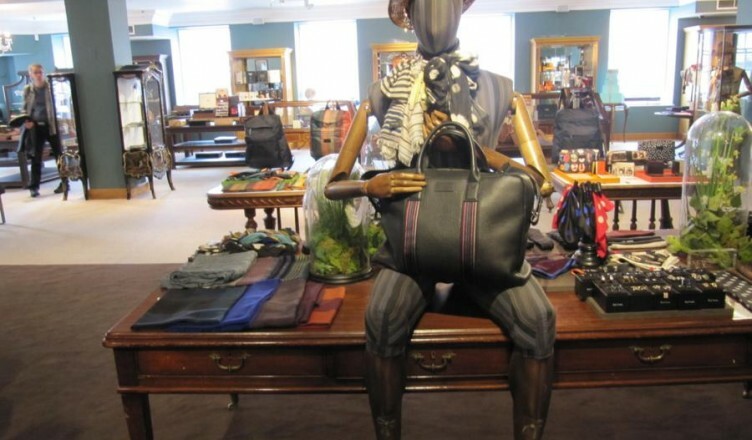 You love luxury, famous brands of clothes, jewelry and watches, auction houses and art galleries? You are in the right place! Look around you on New Bond Street and feast your eyes in the expensive shop windows. You find yourself in one of the most famous streets of luxury in the world. 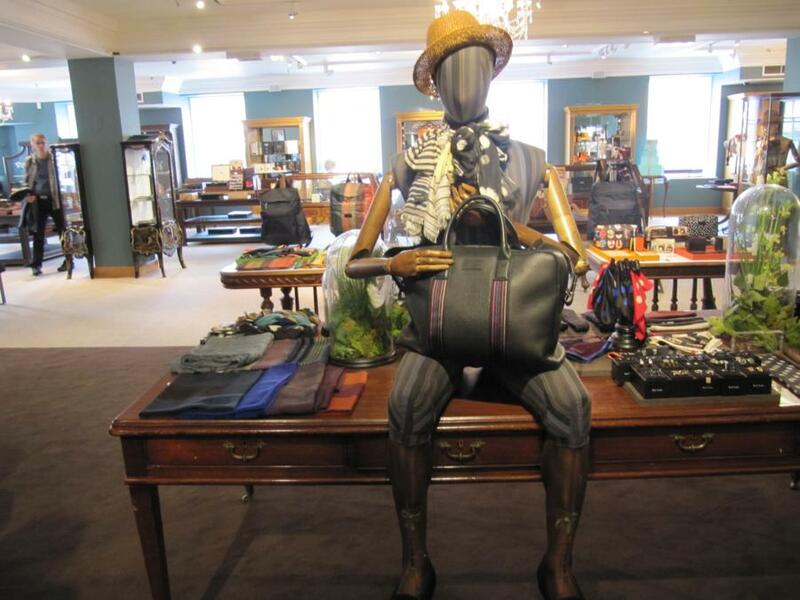 This is also the area which has been synonym with old style classic men fashion. Turn left on Clifford Street and then right on Savile Row: this is the road where the most famous tailors in London have their premises, some of them since 1850! For example, Henry Poole – at number 15 – was the creator in 1860 of the jacket called tuxedo (or smoking). 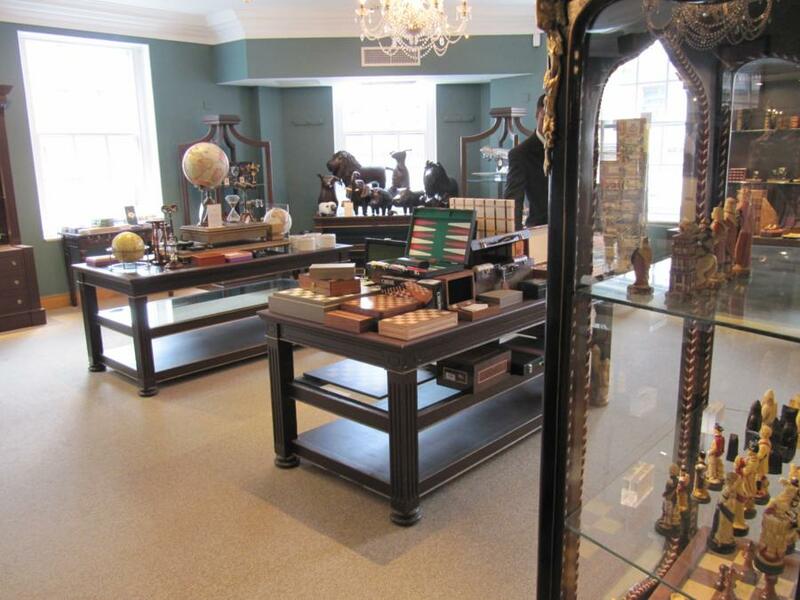 Even today Savile Row is synonymous with exclusive masculine elegance. Did you know? In Japanese the word that identifies the classic three piece man suit is “sabiro”, (which should sound more or less like the name of the street). Music lovers will probably know that at number 3 were the buildings of the Beatles‘ company Apple and it was on the roof of that building that they performed together live for the last time. At the end of Saville Row, we turn left on Vigo Street, and then right onto Regent’s Street, to get back to Piccadilly Circus, thus concluding our walk in Mayfair.